With holiday party invites signed, sealed and delivered, the Shop With Us team is determined to make a stylish statement all season long. Sure, it’s easy to rely on our tried and true collection of little black dresses, but we can never go wrong with a more festive outfit. From velvet trousers, satin tops, leather toppers and more, there are a variety of ways to turn heads. Luckily, Express has an impressive arsenal of fashion-forward picks that will have Us looking like the belle of the ball. The style that immediately caught out eye was a beautiful patterned minidress. Effortlessly chic yet dazzling, this sizzling number will take the guesswork out of figuring out our next night out or holiday party outfit! See It: Grab the Patterned Sequin Minidress at 40 percent off the original price of $118, now $71 while it’s still in stock in regular and petite sizes. Be sure to check out Express for other sensational sale finds to add to your closet. The Patterned Sequin Minidress boasts a deep V-neck detail, an allover sequin design, long sleeves and a silky lining, this sweet mini is equal parts stylish and comfortable — just how we like it! The length gives us a great opportunity to show off our legs (though it’ll look just as dazzling if paired with opaque or shimmery black tights). Complete with a straight hem and a subtly cinched waist, this design can be worn solo or teamed with leggings. Available in a stunning silver and black hue, this versatile find is ideal for holiday parties and beyond! We can’t wait to pair the piece with chic booties or slim-strap sandals for a look that’s sure to turn heads. Normally retailing for $118, we can snag this find at a 40 percent off markdown, leaving Us with a $71 price tag! Can you blame us for swooning? Ready to hit your first holiday party? We’re wearing this stunning minidress with a top coat, silver sandals, an embellished clutch and a bold lip for an eye-catching look. For a night out on the town with our friends, we’re pulling out a fur coat, black boots and a cross-body bag to up the ante. For a chic thinking of a cocktail ensemble, we can pull out a sleek pump, drop earrings and a leather wallet on a chain to seal the deal. Shoppers who purchased this frock are in awe with its top-quality construction and flattering silhouette. Reviewers love that this design provides a comfortable wear without the itchy feel. One shopper shared that the style is great for highlighting any curves. Multiple shoppers exclaim that it is a super versatile piece that can be worn for just about any party dress code. It’s flirty yet classy and a great way to ensure that compliments keep flowing your way all night long. Unlike many party dresses, this low-cut number can be worn with a basic bra underneath. The beautiful minidress is currently available in three sizes ranging from XS to M, though with the dramatic discount, there’s no telling how quickly this frock will go out of stock. It’s also available in a petite length. For nights that we’re not in the mood to wear a dress, we’re relying on the Multicolor Sequin Jumpsuit to make us look and feel ready to conquer the world. Designed with beautiful vertical and horizontal stripes, this find will certainly have us standing out in the crowd. A great find that is body inclusive, this design will have Us looking like a million bucks! Featuring a deep V-neckline and adjustable cami straps, this piece is designed to turn heads. We also love that this style nips at the waist to provide Us with an hourglass silhouette. Reviewers sing the style praises too! Multiple shoppers dubbed the outfit “iconic” and say they can’t wait to wear it on New Years Eve and to upcoming holiday parties. 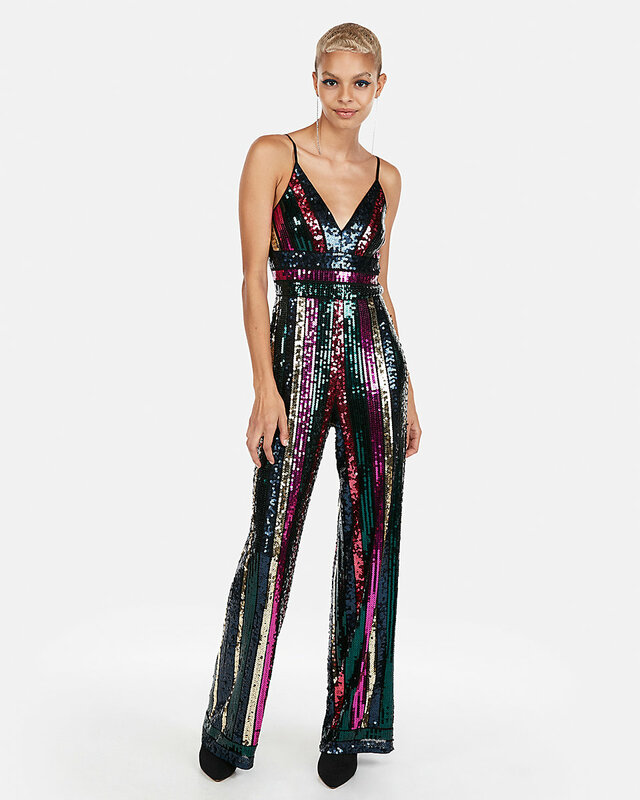 See It: Grab the Multicolor Sequin Jumpsuit at 40 percent off the original price of $148, now $89, while it’s still in stock. Be sure to check out Express for other sensational sale finds to add to your closet.